Many businesses hire commercial cleaning company on contract to keep their office buildings clean and well maintained. A clean and well-maintained office building creates a positive impression on customers and a healthy work environment for the employees, while also saving money on major remodels and replacements. By contracting a commercial cleaning company, business owners don’t have to worry about calling cleaners every now and then. A convenient cleaning schedule is laid out at the time of signing the contract, and the rest is handled by the contracted commercial cleaning company. But sometimes, commercial contract cleanings can also become a security concern. As you might know, commercial cleaning companies often access facilities out of normal working hours. That’s when it’s most convenient for both the parties. There are no concerns about the office workflow getting disturbed, and the cleaning operatives can also do their job in peace. And since most of the office staff during this time has left for home, the cleaning operatives can use the facility in any way they may want. That’s when the alarm bells start ringing. 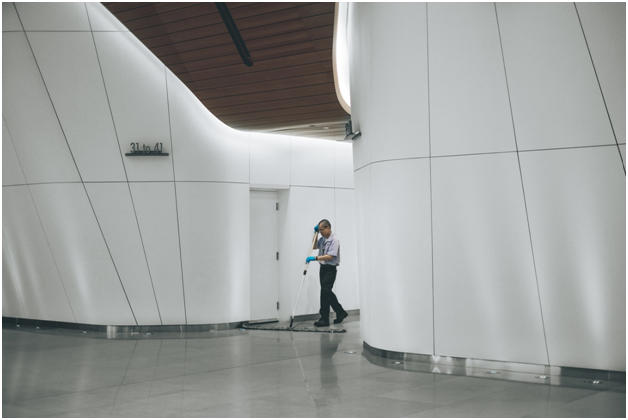 If a cleaning company has employed workers who either cannot be trusted or have a shady background, the security of the facility can become a real concern. Just to put things into perspective, there are more than 11 million illegal immigrants currently living in the United States. Many of them are working in different occupations on forged identification documents. Then, there are people who have a criminal past and, having either been released from prison or escaped from it, have blended themselves well within society. Therefore, it’s quite likely that a cleaning contractor may end up hiring the wrong people for the job if proper vetting procedures are not observed during the hiring process. Commercial cleaning companies, therefore, must always run a thorough background check whenever they‘re recruiting. It’s worth mentioning here that we aren’t trying to discriminate against anyone or to hurt anyone’s feelings – everyone has the right to lead a better life and earn an honest living for themselves and their families. Neither, is there any political agenda that we’re trying to push. We just want the best for the companies who are part of the commercial cleaning industry and the customers (the businesses) who hire these companies. Where commercial cleaning companies must perform their due diligence at the time of hiring staff, business owners should also make sure that they contract a company that is reliable and dependable. Referrals and an intensive online research are the best ways to reach out to such companies. Here at Excellence Janitorial Services and Carpet Cleaning, we vet all of our staff thoroughly. We have been servicing businesses in the Bakersfield area for over 25 years and as a result, we have managed to establish a strong reputation in the local market. If you are looking for a commercial cleaning company that is reliable, dependable and super-efficient at its job, contact us to discuss your commercial cleaning needs.